Walter McCarthy challenged you to solve this Mystery Foto from his Long Island Automotive Museum photo collection. Hint: This photo was taken at the opening of the museum on August 27, 1948. Cartoonist Charles Addams (1912-1988), creator of the Addams Family. Addams had "a long collection of rather good vintage cars which included two Bugattis, a 1933 Aston Martin, a supercharged Mercedes S, an Amilcar and the Castagna-bodied Alfa 2300. " Identify the woman in the automobile. Why does she look familiar? 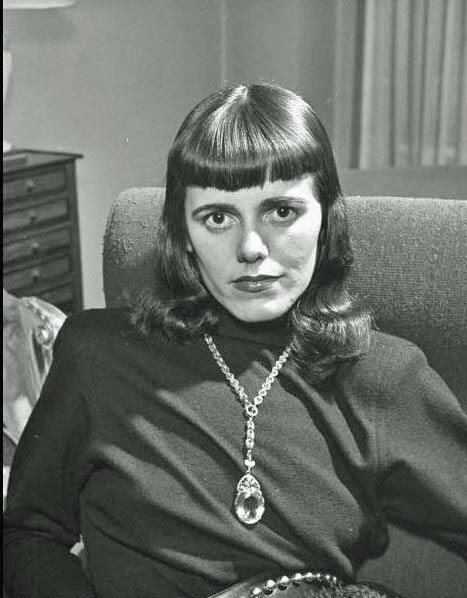 She is Barbara Jean Day Addams, Charles Addams' first wife. As seen below, Barbara was the inspiration for Morticia of the Addams Family. This was Charles Addams' supercharged 1927 Mercedes S-Type. 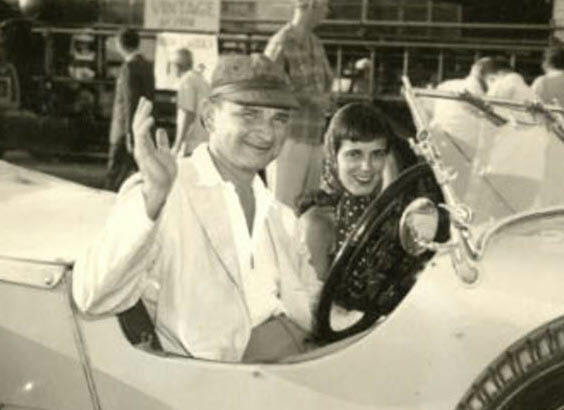 He received the automobile as a gift from playwright Philip Barry (1896-1948), author of Holiday (1928) and Philadelphia Story (1939). 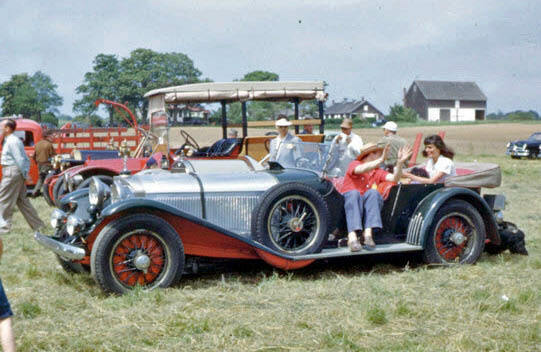 Addams raced the Mercedes in the 1948 Junior Prix at Watkins Glen. Congrats to Steve Lucas, Sam Berliner III, Art Kleiner, and John Bayer for identifying Charles and Barbara Jean Addams. 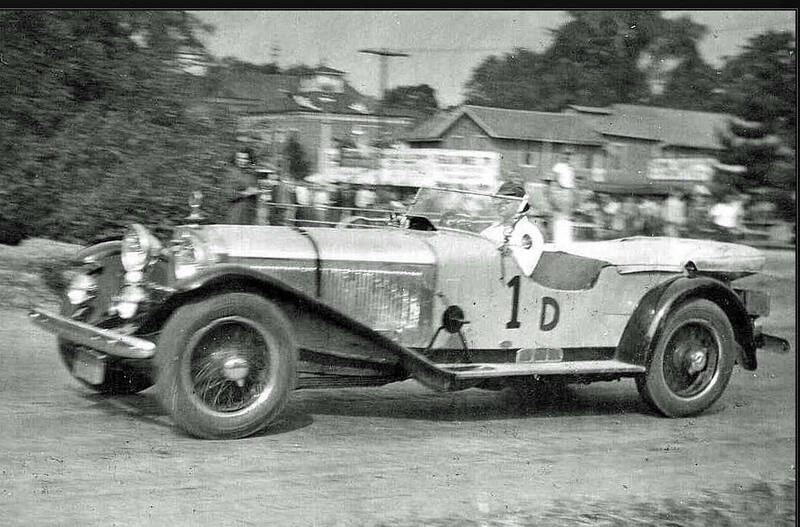 Kudos to Sam Berliner III and John Bayer for identifying the 1927 Mercedes S-Type. Update 10/30/2016: H. Kevin Miserocchi, Executive Director of the Tee and Charles Addams Foundation provides insight into the below famous photo of Charles Addams drawing Morticia. Barbara and Charles Addams as photographed by George Silk for Life magazine (1948). 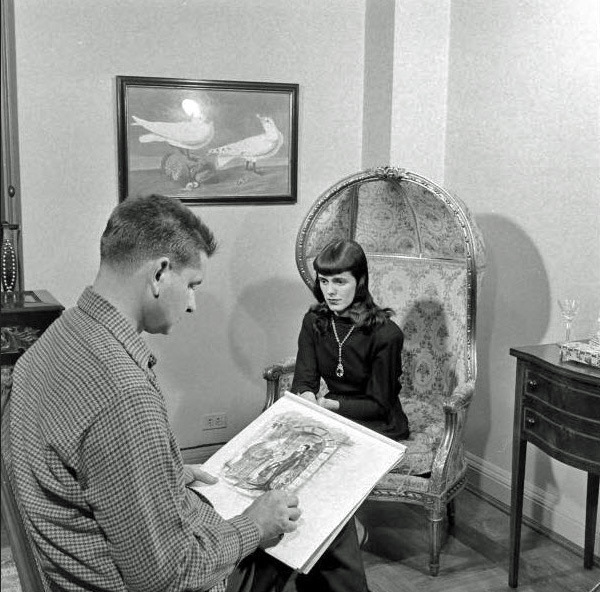 Barbara Jean "modeling" for a Morticia cartoon in a set-up shot. Charlie created the character who became known as Morticia in 1933, many years before he married Barbara or either of his two other wives, all of whom had that look. The photograph of Charlie drawing Morticia as Barbara “poses” was nothing more than a set-up shot. Barbara told me that she hated all that referencing of her and Morticia and, after her divorce from Charlie, she cut her hair into a page-boy and wore it that way the rest of her life. 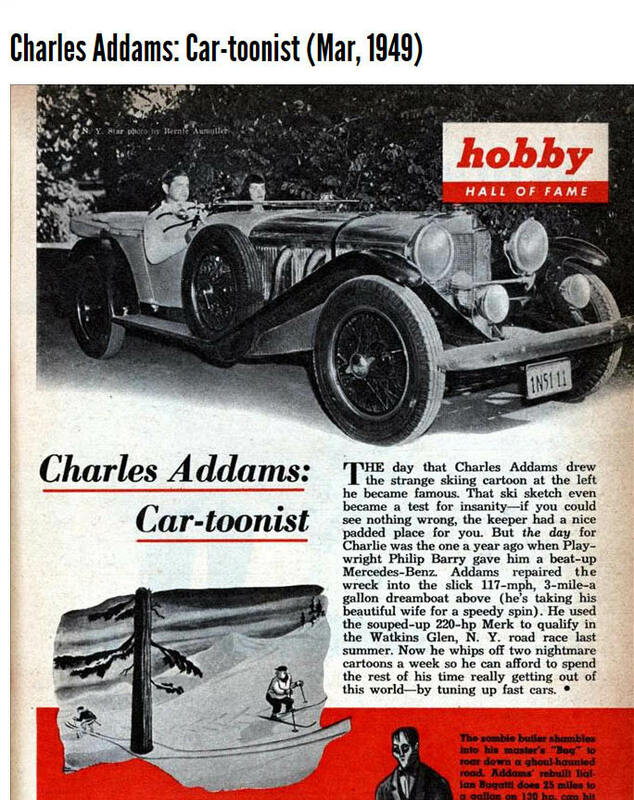 “Racing came more naturally to Charlie [Addams] than to Philip [Hamburger] and me; he has always been a collector of fast cars and in his youth he used to take part in races out on Long Island. He likes both fast cars and very old ones: in the nineteen-forties, he received as a present from the playwright Philip Barry, then living in East Hampton, a 1928 Mercedes-Benz, which Ellen and Philip Barry had driven on the Riviera in the gaudy twenties (the car was sacred for having been occupied by, among others, Sara and Gerald Murphy, Zelda and Scott Fitzgerald, Léger, and Picasso) and which eventually died, much mourned, in Charlie’s arms. Today  he owns a 1926 Bugatti, a 1933 Aston-Martin, and, for purposes of ordinary transportation, a 1973 Alfa-Romeo. 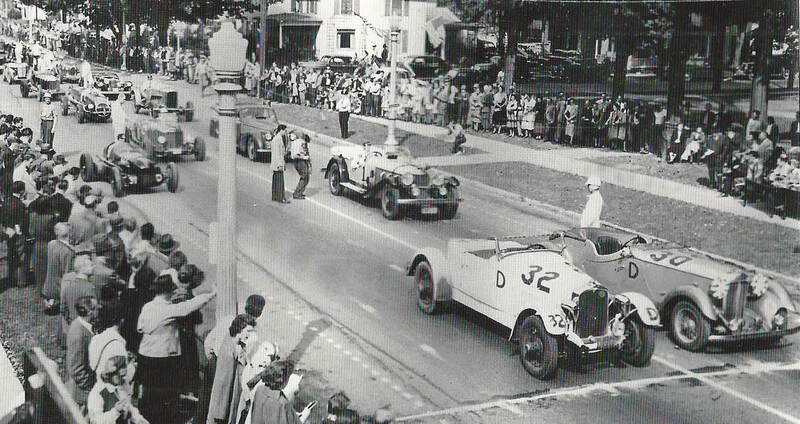 Charles Addams drove the Mercedes (#1 in the second row) at the Watkins Glen 1948 Junior Prix. Addams, wearing a deer-stalker hat, finished 11th of the 23 starters. Charles and Barbara at the 1951 Bridgehampton Races. 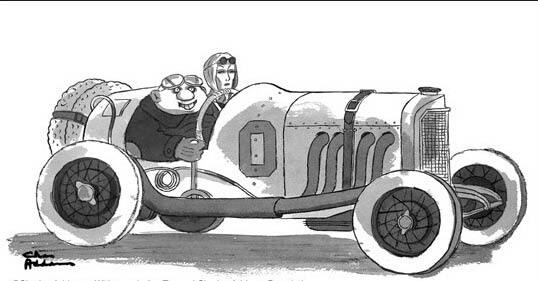 Charles Addams based this cartoon "Uncle Fester prepares to go racing with Morticia in an old Mercedes" on his 1927 Mercedes. 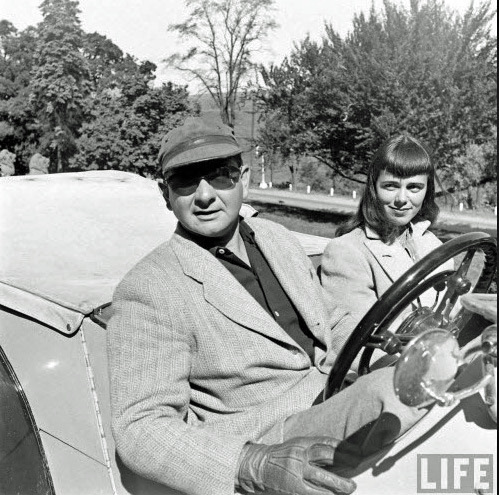 That’s famous cartoonist Charles Addams and his wife Barbara. 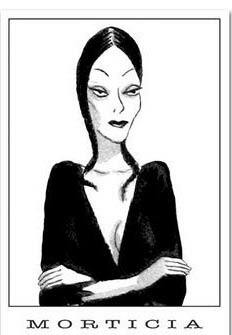 Some say that Morticia from “The Addams Family” was drawn by Addams to look like Barbara. As to the car: no idea so I’ll just guess 1924 Bentley. Thanks a million - your photo clearly establishes the presence of those mini-rear-tonneau doors beyond question! Sid Caesar and Imogene Coca? Could that be cartoonist Charles Addams? In a Mercedes? With his wife, Barbara Jean Day who would become the inspiration for Morticia Addams of TV fame? 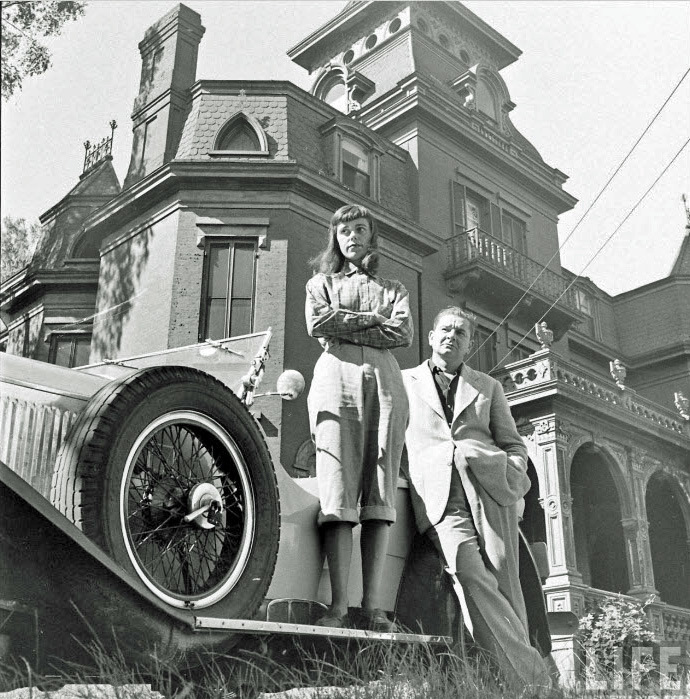 Mystery photo guess; Charles and Tee Addams and a Bugatti? Nice links Sam and John. Great stuff everyone, had no clue.